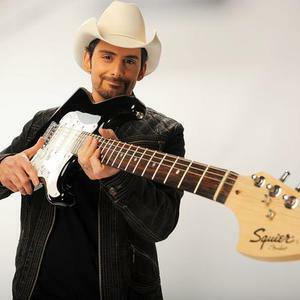 Brad Paisley (born October 28, 1972) is an American country music singer and songwriter from Glen Dale, West Virginia. Brad Paisley has stated that his love of country music stems from his maternal grandfather, who gave Paisley his first guitar at age 8 and taught him how to play. At age 12, Paisley wrote his first song, and by 13 he was the opening act for country singers. Paisley graduated from John Marshall High School in Glen Dale and enrolled at Belmont University (from 1993 to 1995). While in college, he met Frank Rogers, a fellow student who went on to serve as his producer. Brad Paisley has stated that his love of country music stems from his maternal grandfather, who gave Paisley his first guitar at age 8 and taught him how to play. At age 12, Paisley wrote his first song, and by 13 he was the opening act for country singers. Paisley graduated from John Marshall High School in Glen Dale and enrolled at Belmont University (from 1993 to 1995). While in college, he met Frank Rogers, a fellow student who went on to serve as his producer. Paisley also met Kelley Lovelace, who became his songwriting partner. After graduating from Belmont, Paisley signed a songwriting contract with EMI Music Publishing. His debut as a singer was with the label Arista Nashville, with the song, "Who Needs Pictures" (released February 22, 1999). In May of that same year, he made his first appearance on the Grand Ole Opry. Seven months later he had his first #1 hit with, ""He Didn't Have To Be." In 2000, Paisley made an appearance on the nationally televised special, "Route 66: Main Street America" featured on TLC (TV channel) and later that same year he won the Country Music Association's (CMA) Horizon Award and the Academy of Country Music's best new male vocalist trophy. He received his first Grammy Award nomination a year later. On February 17, 2001, after forty appearances on the show, he was inducted into the Opry Hall of Fame. In 2002, he won the CMA Music Video of the Year for ""I'm Gonna Miss Her (The Fishin' Song)." Several celebrities made notable guest appearances in the video, inluding Little Jimmy Dickens, Kimberly Williams (Paisley), Dan Patrick, and Jerry Springer. Paisley released his third album, Mud on the Tires (2003), following Who Needs Pictures and Part II. The album features the hit song "Celebrity," the video of which parodies reality shows such as Fear Factor and American Idol and included such celebrities as Jason Alexander, Little Jimmy Dickens, Trista Rehn, and William Shatner. The album's title track, "Mud on the Tires," reached Billboard #1 in 2004. In 2005, after touring with Reba McEntire and Terri Clark on the critically acclaimed "Two Hats and a Redhead Tour," he released Time Well Wasted, containing 15 tracks, including "Alcohol", a duet ("When I Get Where I'm Going") with Dolly Parton, another ("Out In The Parking Lot") with Alan Jackson, and a bonus track, "Cornography". Brad Paisley was the 2008 CMA and ACM Male Vocalist of the Year winner. Starting with the release of his 1999 album Who Needs Pictures, Paisley has recorded seven studio albums and a Christmas compilation on the Arista Nashville label, with all of his albums certified gold or higher by the RIAA. In addition, he has charted 25 singles on the U.S. Billboard Hot Country Songs charts, 15 of which have reached #1 with a record 10 consecutive singles reaching the top spot on the charts. On November 10, 2010, Paisley won the coveted Entertainer of the Year award at the 44th annual CMA Awards. In 2009 he released American Saturday Night which has his first single Then.